A Mystic Seaport Wedding is a wonder to be a part of. Established in the 1900s, Mystic Seaport is home to the largest maritime museum in the United States. Mystic Seaport is a prime location for weddings, with a variety of venues to choose from and gorgeous waterfront views. Mystic Seaport Wedding venues include locations such as the River Room, the Patio Terrace, the North Lawn, and the Boat Shed. Summer is the perfect time for a wedding celebration in Mystic so that couples and their guests can take in the beautiful scenery of the seaport. The bride and groom pictured chose a July wedding, allowing them to experience the fresh air and all that Mystic has to offer in the summer months. In this photo, the couple strolls through Mystic, the groom holding an arm out for his bride in a gentlemanly fashion. This is fitting being that they are dressed so elegantly. 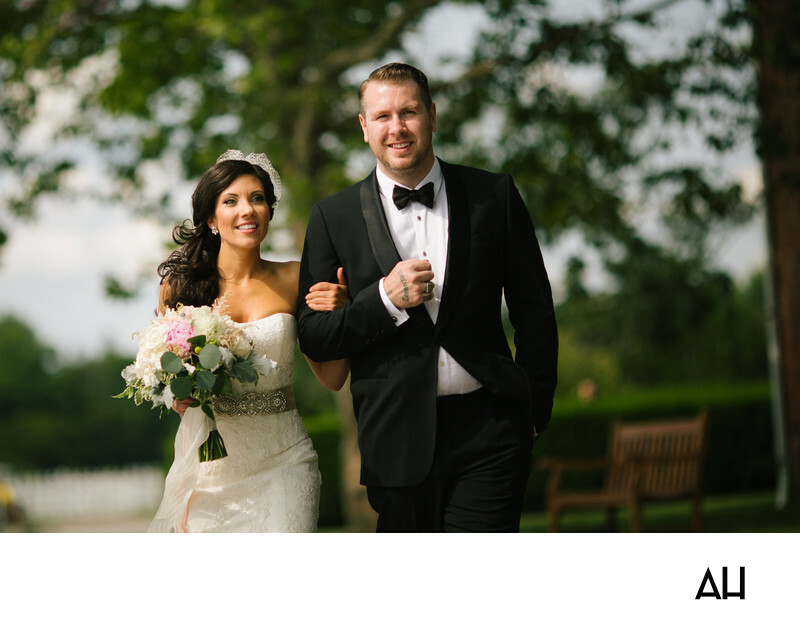 The groom in a classic black tux and the bride in a lace wedding dress. The pair looks ahead into the future and their eyes shine from the joy of the day. There is an identical look of wonderment on their faces, and they are sure-footed as they step forward on the path of their relationship.